Other variations arise when the Qumran manuscripts are compared both the Septuagint (Greek translation of the Hebrew Bible) and the Masoretic Texts. It appears that in some instances, the Qumran texts agree with the Septuagint over the Masoretic texts, such as in Exodus 1:5 where the Masoretic Text writes of 70 descendants, while both the Septuagint and 4QExod claim 75. Another interesting example is the case of Jeremiah, which is approximately 1/8 shorter in the Septuagint than in the Masoretic Text. Six manuscripts of Jeremiah were recovered from Qumran, and of those, most clearly have the Masoretic Text. However, one manuscript (the second copy from Cave 4) just as clearly contains the shorter Greek version, missing the same verses not found in the Septuagint. The Jewish historian, Josephus, who wrote a history of the Jews called “Jewish Antiquities” wrote of a lengthy summary of the biblical narrative in 1 Samuel 11 about Nahash, adding details not found in the biblical tradition. This additional material was also found in 4QSam at Qumran. VanderKam also adds a chapter comparing the language of the scrolls with the New Testament. He is quick to point out that while the texts do share some common language, Jesus was never mentioned in the Dead Sea Scrolls, and it is almost universally accepted that he was not the Teacher of Righteousness. Themes such as the calendar, common practices of sharing a meal, and eschatology and messianism are also addressed. In a final chapter, VanderKam describes the controversies involved in editing and publishing the scrolls including the protest against Strugnell and the alleged suppression of the texts. 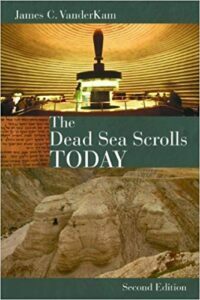 Overall, if you’re looking for a concise history and overview of the Dead Sea Scrolls, this book will get you started. However, it does not contain the texts themselves, so if you’re looking for a translation, try F. Garcia. Martinez or G. Vermes‘ translation.